The best part that I enjoy HTC Vive is the part where I get to create/paint a 3D object. The painting application not only contain conventional paint brush for the users to paint their objects but also provide other paint brushes such as smoke, rainbow, stars, etc. This make me felt that I was not only painting an object but rather more like decorating a space where all sorts of imagination is possible. Furthermore, within the application I was able to take a snapshot of my work and share it with other people I wish to share after my experience. In addition, an other application that I enjoyed was the flying experience application where it stimulate the movement of an object flying in between the clouds. I enjoy the application because although my body was not physically moving as the view, I still felt the movement as the setting changes. The application showed the attempt of the development team trying to combine VR applications with sports. The application show me the potential of VR in the sports domain. On the other hand, one aspect that I didn’t enjoy was the solitary part of using VR. While experiencing VR because of its physical and functional constraints I was not able to interact with other people even when other people are in the same room with me. I will be great if I may interact with other people while using the VR. Another aspect that the design team didn’t address is the physical relationship with other objects in the room while using VR. There were several occasions where had other people not warned me about other objects in the room, I would have bumped into them. As a result, it will greatly enhance my experience if the design team address this issue. 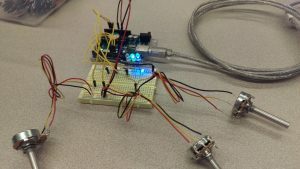 I used Arduino with servo motor. 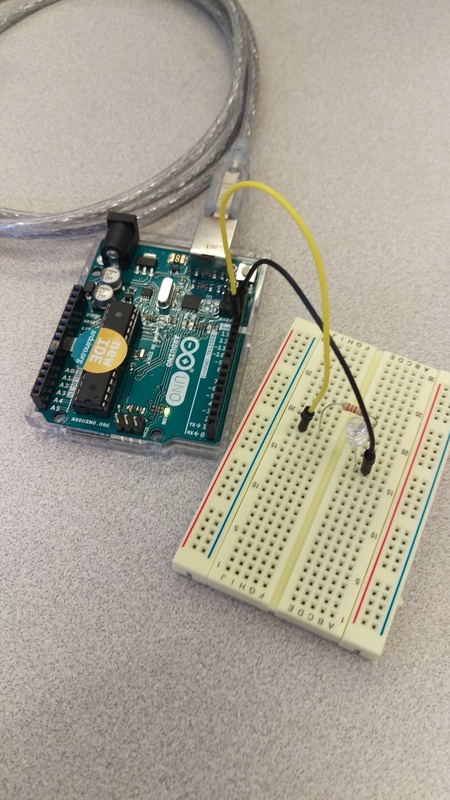 I followed the lab instruction and set up the Arduino with a servo motor. 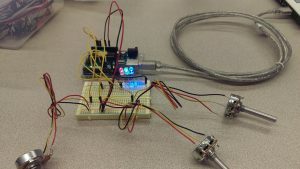 I used the sample code provided in the lab to make Arduino interact with the servo motor. I also attached the servo motor with for legs and decorated the servo motor. Lastly, I uploaded the code and took pictures of the result. 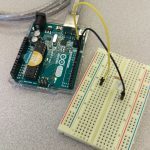 I used Arduino with force sensor. I edited the sample melody (twinkle twinkle little star) sketch code to make the piezo buzzer play the meolody and use the force sensor to control the melody’s tempo. With different value detected by the force sensor, the tempo of the melody will change. Also, to make the input and output coincide I attache both the piezo buzzer and force sensor to the android toy. Lastly, I uploaded the code and took pictures of the result. 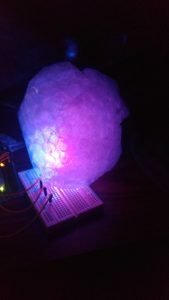 In the article “Prototyping: Generating ideas or Cargo Cult Designs,” the author discussed the dilemma and limitation of prototyping. In the authors view, prototyping has been a successful and useful tool for interaction designers to foster creativity and to facilitate their design process and discussion with other team members. However, one should be careful in term of over promising the feasibility of these prototypes. In order to prevent having a feature that is not actually feasible in reality, the author recommend the designers to conduct researches about the technologies and their limitations. In his article, the author argues that while prototyping provides a common focal and discussion point among different team members, over emphasis on the hypothetical features on the prototype could cause illusion to the team members regarding the reality of making these features into an actual product. This false belief of the pseudo feature of a prototype is what the author refers to as a “Cargo Cult Design.” Furthermore, in order to fix this problem, the author proposed that interaction designers should conduct prior researches regarding the background of the potential technologies and their limitations before designing the hypothetical features of a prototype. In this way, while having the discussion with the team, the designers will also have an idea about what’s actually feasible in reality rather than falling into the illusions that everything is feasible. In addition, the author also suggest that in order to prevent a prototype falls into a cargo cult experience, designers should realize that prototyping a helping the team to explore rather than an end product. 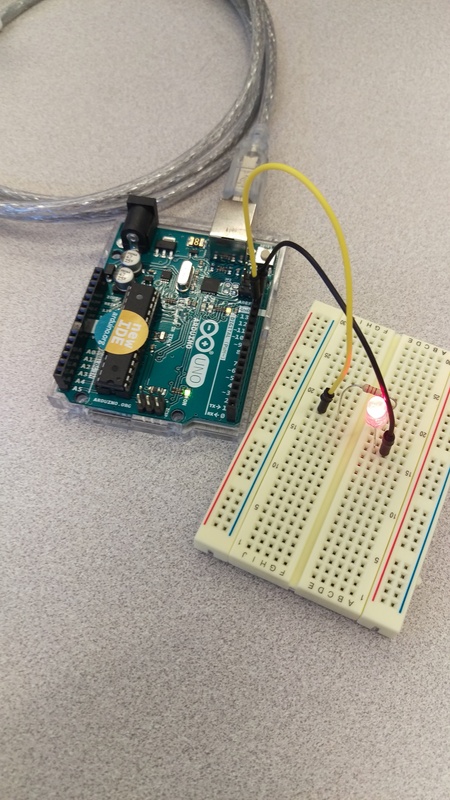 I used Arduino with force sensor. I edited the sample process sketch code to turn on the circle into squares with changing color and changing the corners with round angles via force sensor interaction. With different value detected by the force sensor, the color and the size of the square will change as well as the degree of angles of its corners. Lastly, I uploaded the code and took pictures of the result. String portname = "COM3"; // or "COM5"
I used Arduino with three LEDs (red, blue and green). I edited the sketch code to turn on the LED with keyboard interaction. Each enter of the corresponding key is 255/10 of the brightness. I also use bubble rap to create an air balloon as a diffuser. 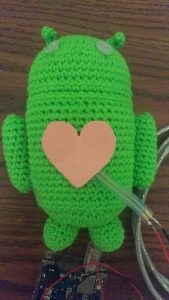 I then turn the red and blue LED to 127 and green LED to zero to make a purple air balloon. However, the result is not as expected. Blue and Red are still somehow separated. Lastly, I uploaded the code and took pictures of the result. 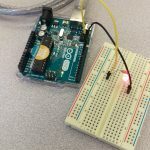 I used Arduino with a red LED. I edited the sketch code to turn on the LED for 10 seconds and then off for 2 seconds. Uploaded the code and took pictures of the result.